The winds that had been blowing hard for the past several days continued into Monday and Tuesday, 3/6 and 3/7, with gusts still at 20 knots and seas offshore still too choppy for my fishing party, Shawn Enoch and his parents, Janie and Monty. So we fished south Estero Bay’s backwaters instead of heading offshore. The group caught two sand bream, five sheepshead that included one keeper at 13 inches, and a half-dozen black drum short, all on live shrimp. Seas were calm Wednesday but, unfortunately, my fishing client for that day took ill, and we had to cancel the trip. Thursday, 3/9, seas were still calm, though they picked up in the afternoon, while I fished 26 miles west of New Pass with Ken Spaulding and his friends, Dave, DeeDee, Lee, and Wayne. The group caught and released over thirty red grouper up to 19 7/8 inches, just 1/8 inch short of keeper size. But, even if not keepers, they had fun reeling them in on light tackle. As for food-fish, the lane snapper were biting like crazy, and the group boxed thirty of 70-plus keeper-sized lanes. They added a few nice grunts to the fish box for some variety. We used squid and cut-bait. Friday morning, 3/10, calm seas greeted us once again, and I headed offshore 22 miles with Pat Dombrovski and his son, Noah. The guys used cut-bait and squid to catch two keeper red grouper at 21 inches and 22 inches, and released a dozen red grouper shorts. They also caught twenty-five keeper lane snapper to 14 inches and a half-dozen grunts. They released a 15-inch, out-of-season triggerfish. Monday, 3/13, I headed 22 miles offshore with Janice Penland, her grandchildren, Joe and Samantha, and their friends, Mackenzie and Kabon. The group used squid and cut-bait to box twenty keeper lane snapper to 14 inches, and they released an equal number of those. They also released sixteen red grouper shorts to 18 inches. As a weather front approached in the over-night hours, the winds and seas picked up and, by Tuesday morning, 3/14, there were wind gusts approaching 30 mph, along with big waves and small craft advisories offshore. Nate Binder and his friend, Reno, had planned to fish offshore but I had to advise them otherwise. So we headed into the backwaters of southern Estero Bay, seeking good fishing holes and protection from the wind. First cast yielded a 24-inch redfish, followed quickly by another bite that took the bait, but not the hook, and got away. A 14-nch sheepshead was added to the box, and the guys released one short sheepshead short, one black drum short, and a 6-pound, 19-inch crevalle jack. Everything bit on live shrimp. With slightly decreased but still hefty winds blowing Wednesday morning, 3/15, I fished the backwaters of southern Estero Bay with Bill and Terri Tank, who used live shrimp to catch five keeper sheepshead to 14 inches. They released three mangrove snapper shorts. Overnight temperatures dropped to 43 degrees in in Bonita Beach, and I spent a chilly, windy, but productive morning on Thursday, 3/16, fishing in south Estero Bay with Michael Want and his thirteen-year-old son, Kevin, who had also fished with me last March. The guys used live shrimp to catch twelve keeper-sized sheepshead to 16 inches, which they chose to release. Friday, 3/17, Mark and Sherri Gahl and their son, Zach, spent St. Paddy’s Day fishing southern Estero Bay’s backwaters with me, using live shrimp. They caught nine sheepshead, including six keepers to 17 inches, and released a few mangrove snapper shorts. Jim Danfort, Sr. and son, Jim Danfort, Jr. fished 23 miles west of New Pass with me on Saturday, 3/18, using squid, cut-bait and pinfish. They caught two keeper red grouper on pinfish, one 22 inches and one 25 inches. Lane snapper were biting well, and the guys added to the fish box thirty keeper lane snapper to 15 inches. Monday, 3/20, seas were too rough offshore for my planned trip, and those guys rescheduled. Chuck Spears and his son, Jason, fished a catch-and-release trip in Estero Bay with me on Tuesday, 3/21, using live shrimp. They guys released six sheepshead to 13 inches, a small crevalle jack, a 15-inch whiting, and seven mangrove snapper shorts. 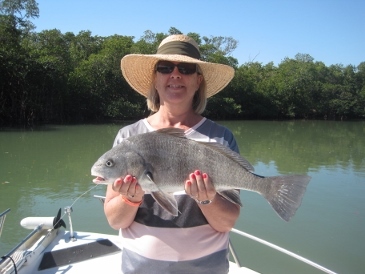 Wednesday, 3/22, I had another catch-and-release trip in south Estero Bay’s backwaters, this time with Dan and Amber Swanson, who landed eleven black drum to 25 inches, a 13-inch sand bream, and a spade fish, all on live shrimp, and all released, after a few photos. Friday’s windy morning found me back in the backwaters, this time with father and son, Jim and Brad Large, who used live shrimp to catch eleven black drum to 23 inches, a 13-inch sheepshead, and a sand bream. They released eight of the drum and the sand bream, and boxed the rest of their catches. The photo shown below is of Jim Danfort with a 25-inch red grouper, caught on a pinfish 23 miles west of New Pass on n offshore trip 3/18/17. The photo shown below is of Amber Swanson with a 25-inch black drum, caught on shrimp in Estero Bay on an in shore trip 3/22/17.